Not to be confused with the comedy manga/anime series Ping-Pong Club. Ping Pong (Japanese: ピンポン, Hepburn: Pin Pon) is a manga series by Taiyō Matsumoto about table tennis. It was serialized in Shogakukan's seinen manga magazine Big Comic Spirits from 1996 to 1997 and collected in five tankōbon volumes. It was adapted into a 2002 live-action film. An anime television series adaptation produced by Tatsunoko Production and directed by Masaaki Yuasa was aired on Fuji TV's noitamina block between April 11, 2014 and June 20, 2014. The North American anime licensor Funimation streamed the series on their website. Despite having drastically different personalities, high school boys Peco and Smile have been friends since childhood. Now, they’re both talented members of table tennis club of Katase High School. Peco gets decisively defeated by a Chinese student and thus becomes so devastated that he quits practicing. Meanwhile, Smile's personality always prevents him from winning against Peco. Coach Jō, however, discovers Smile's potential and tries to motivate him to overcome his psychological obstacle. One of the protagonists and Smile's childhood friend. Peco is loud, cocky, and carefree. He is initially considered one of the best players on the Katase team, but begins questioning himself after a couple of surprising losses. Peco is frequently seen snacking on various junk food items. The second protagonist, Smile, is quiet and reserved. He is nicknamed Smile because he seemingly never does. Smile is an exceptionally skilled player, but often lacks the drive and ruthlessness to win. Nevertheless, his talent is recognized by many, including Koizumi, Kong, and Kazama. Kaio's team captain and star player. Kazama is a pragmatic individual who values winning above all else. His skill and power tend to overwhelm even high level opponents. Kazama attempts to recruit Smile to the Kaio team upon noticing his potential. A transfer student from China who was kicked off the national team. His original goal was to return to his home country after redeeming himself abroad. Kong exudes an air of confidence that belies his feelings of shame and resentment. The elderly coach of the Katase team. Though his behavior is sometimes silly, he has a deep sense of commitment to the sport and can be demanding of his players. Koizumi takes great interest in Smile and decides he will force the young player to realize his potential through any means necessary. A childhood rival of Peco's and a member of the Kaio team. Sakuma lacks natural talent but tries to compensate with hard work. He has an aggressive nature and is fixated on beating Peco as well as proving himself. The elderly chain-smoking owner of the table tennis dojo where Smile and Peco learned the sport as children. She cares for the two young players, despite her outwardly tough, jaded persona. Team captain of Katase, known for his unusual hairstyle. He helps run the family appliance store and is often occupied with odd jobs after school. The second-best player on the Kaio team, who quietly envies Kazama and hopes to rival him. Another top player from Kaio. Patriarch of the Kazama family and President of Kaio, a shrewd businessman who does not tolerate failure. He is Ryuichi's grandfather. Yurie's father and Ryuichi's uncle, coach of the Kaio team. Ryuichi's fashionable cousin, who has feelings for him. Obaba's son, who trains professional table tennis players. Recurring side character, a wanderer with a restless soul. Ping Pong is written and illustrated by Taiyō Matsumoto and published by Shogakukan. The manga ran in Big Comic Spirits weekly magazine from 1996 to 1997. The chapters were collected and released into six bound volumes from July 1996 to August 1997. The manga was re-released and reformatted into three volumes between July 14, 2012 and August 10, 2012. 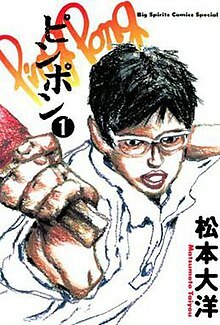 Shogakukan re-released the manga again in two volumes on April 1, 2014 under the new title, Ping Pong: Full Game No (ピンポン　フルゲームの, Pin Pon furu gēmu no). An anime television series adaptation produced by Tatsunoko Production and directed by Masaaki Yuasa premiered on April 11, 2014 on Fuji TV's noitamina block. The opening theme is "Tada Hitori" (唯一人) by Bakudan Johnny and ending theme is "Bokura ni Tsuite" (僕らについて) by Merengue. "The Wind Makes It Too Hard to Hear"
Two old friends go to spy on a new table tennis champ at a rival high school, but meanwhile their own team is falling apart. Coach Koizumi has started working Smile hard, who definitely doesn't appreciate the extra attention. "Staking Your Life on Table Tennis Is Revolting"
All the teams gather at the prefectural qualifiers, and China gets to play Smile at last. "The Only Way to Be Sure You Won't Lose Is to Not Fight"
Peco learns a hard lesson from someone he never took seriously enough, and then we finally see how Dragon earned his name. Dragon's obsession with Smile prompts Akuma to do something rash. "You Love This Sport More Than Anyone!!" Five athletes have five very different Christmas Eves, and Peco gets a wake-up call. Players, coaches, captains, and their families. Smile, Peco, Dragon, and China begin another prefectural qualifier. Will the results be different this year? In the third round, Dragon has an unexpected visitor, Sanada questions himself, and Peco scares lots of people in lots of ways. "I Thought You Were the Hero!!" Peco and Dragon tackle the question of whether only birds can fly. The final match is on. ^ Nicoletta Christina Browne. "Ping Pong:The Animation". THEM Anime Reviews. Retrieved July 23, 2018. ^ "Ping Pong the Animation". Funimation. Retrieved June 28, 2017. ^ "Ping Pong the Animation - The Spring 2014 Anime Preview Guide". Anime News Network. Retrieved June 28, 2018. ^ "Kick-Heart's Yuasa to Direct Ping Pong Anime for Noitamina". Anime News Network. January 16, 2014. Retrieved January 16, 2014. ^ "Funimation to Stream Ping Pong the Animation". Anime News Network. Retrieved 4 April 2014. ^ a b c d e f g h i j k l Michelle Lee. "English Cast Announcements for Ping Pong the Animation and Wanna Be the Strongest in the World". Funimation.com Blog. Retrieved 2013-03-28. ^ a b ピンポン　1 ビッグ　コミックス　スペシャル (in Japanese). Shogakukan. Retrieved 2014-06-14. ^ a b ピンポン　5 ビッグ　コミックス　スペシャル (in Japanese). Shogakukan. Retrieved 2014-06-14. ^ a b ピンポン　1 (in Japanese). Shogakukan. Retrieved 2014-06-14. ^ a b ピンポン　3 (in Japanese). Shogakukan. Retrieved 2014-06-14. ^ ピンポン　フルゲームの　1 (in Japanese). Shogakukan. Retrieved 2014-06-14. ^ ピンポン　フルゲームの　2 (in Japanese). Shogakukan. Retrieved 2014-06-14. ^ ピンポン　2 ビッグ　コミックス　スペシャル (in Japanese). Shogakukan. Retrieved 2014-06-14. ^ ピンポン　3 ビッグ　コミックス　スペシャル (in Japanese). Shogakukan. Retrieved 2014-06-14. ^ ピンポン　4 ビッグ　コミックス　スペシャル (in Japanese). Shogakukan. Retrieved 2014-06-14. ^ ピンポン　2 (in Japanese). Shogakukan. Retrieved 2014-06-14. ^ "Funimation Ping Pong Episodes". Funimation. ^ "Ping Pong episodes" (in Japanese). This page was last edited on 13 April 2019, at 12:14 (UTC).